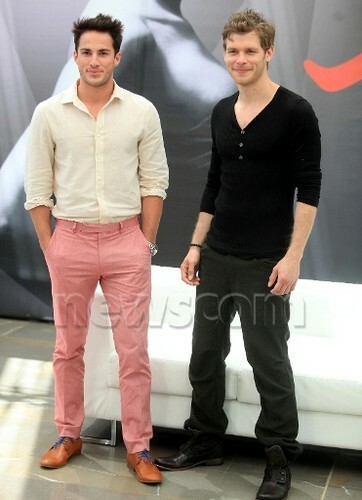 Joseph morgan & Michael Trevino at the 52nd Monte Carlo TV Festival. . Wallpaper and background images in the Vampire Diaries – Fernsehserie club tagged: he vampire diaries events michael trevino joseph morgan monte carlo 2012. This Vampire Diaries – Fernsehserie photo contains gut gekleidete person, anzug, hosenanzug, pantsuit, hosenbein, pantleg, lange hosen, and lange hose. There might also be hose, lange hosen, hosenbein, bellbottom hosen, schlaghosen, hosen bellbottom, bellbottom hose, and glockenböden.